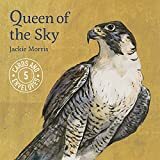 This pack of five beautifully illustrated cards features five of the breathtaking paintings created by Jackie Morris for her tale of nature, courage, and love, Queen of the Sky, which traces the developing bond between a woman and the peregrine falcon she rescued. Each card bears a caption from Jackie on the back and is blank on the inside for your own message. Each pack comes in a hard box that contains five 6.5 x 6.5 inch cards and envelopes.